Many hockey players use the cliché that the game is ""in their blood"" or ""a huge part of who they are"" when talking about their evolution within the game. For Blake Geoffrion of the Nashville Predators, this is actually true in the most literal sense of the word. 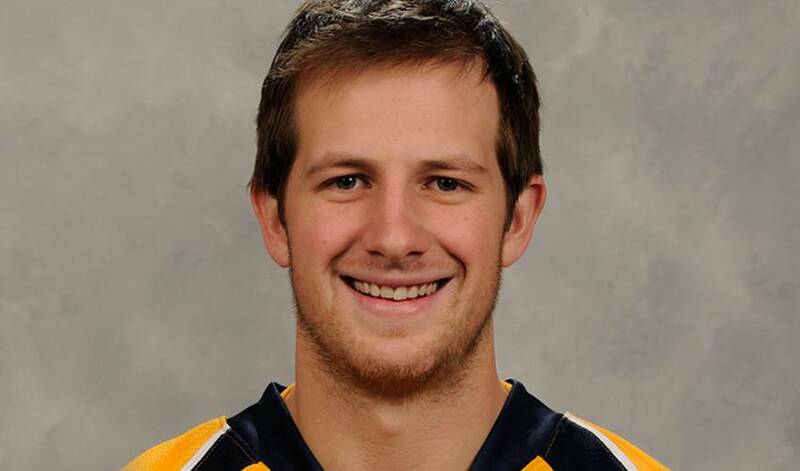 The young, American-born hockey star in Nashville is unique amongst his current NHLPA members and in the grand history of the game, as Blake is the latest member of the Morenz/Geoffrion family to suit up in the NHL. Earlier this season, the great-grandson of Habs legend Howie Morenz (also known as the ""Mitchell Meteor"") became the fourth generation of that family to play at the highest level of hockey in the world, following Morenz, grandfather Bernard 'Boom-Boom' Geoffrion and father Dan Geoffrion. Now, while this in and of itself is a very cool fact, Blake has shown by his play since being called-up by the Predators this season that he does not plan on having that be the only thing that defines his career. The 2009-10 Hobey Baker Award winner from the University of Wisconsin-Madison has stepped into the Predators lineup late in the season and been an immediate spark for the club, which is battling in the tight Western Conference for a playoff position. His youthful exuberance and scoring input have been exactly what the Preds have been looking for as the calendar pages turn towards April and every game matters that much more. Blake looks comfortable in his NHL surroundings, providing a late-season spark and timely scoring while the Predators hope his family lineage and tradition plays a role in helping them achieve playoff glory.